Dragon World is lucky to be home to an incredibly rare white alligator. 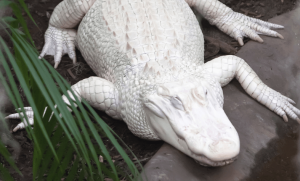 Albino alligators are virtually impossible to find in the wild, as their lack of natural camouflage makes them an inviting target for predators. If you’re a fan of rare, unique animals, you’ll definitely find our white alligator interesting.